1. The model is an upper body of male, which has correct sitting operation position. 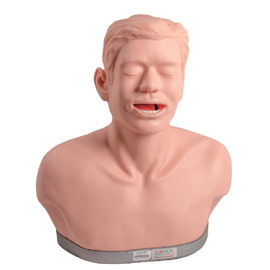 It is lifelike with soft and supple skin tissue. 2. The model features structure of anatomical position of normal thyroid, including thyroid cartilage, trachea, lateral lobe of thyroid gland and isthmus of thyroid gland. 3. Soft tissue (thyroid) could be touched on right side of lateral lobe of thyroid gland, nodules of 15-20 mm, hard texture, slightly fixed, surface is comparatively smooth.